Last week, I argued in favor of giving Windows 10 S a chance. Now I’m putting my money where my mouth is. For the past couple of weeks I’ve been using the new Surface Laptop as my primary computer. Given there’s no way to roll back from Windows 10 Pro once you use the free upgrade, I’m trying to survive on Windows 10 S as long as possible, as that’s how Microsoft hopes the laptop’s buyers will use it too. Yes, there are growing pains, but even as someone already cautiously optimistic about Windows 10 S, I was pleasantly surprised. I’ve amassed some observations from my testing period here. You won’t be able to install all the apps you’re used to on Windows 10 S right now. If you’re reading this article, you probably already know that. That is a significant caveat, but there are some subtle merits to Microsoft’s seemingly-draconian limitations. For one, being forced to only use the Windows Store made me realize that I had become techno-prejudiced (this is a word I have now coined) against it. With Windows 10 Pro, I rarely even bothered check the Store when installing apps, because I assumed there was nothing good to be found. My default behavior was what I’d always done: Google the app and download the .exe file. This is an antiquated, sloppy process. Installing apps from the Store is faster and more secure, makes it easier to compare alternatives, simplifies managing multiple updates, and provides readily available user feedback. Of course, the usual complaint is that the Store is devoid of apps. This is true relative to our mobile devices, but it’s a tired circular argument – nobody uses the Windows Store, because nobody makes apps for it, because nobody uses it. It’s not good reasoning, especially because the Windows Store probably isn’t as bad as you assume. There are some legitimately great apps on the Windows Store. The truly great ones are still rarer than I’d like, but I think the average person can find most of the tools they need for their everyday work. I don’t know about you, but most of my app palette is fairly basic. For PDF’s I use Drawboard, which provides an excellent reading/annotating experience. The Windows Instagram app is almost as good as the mobile versions (and far better than the website). The Netflix app is just as good as the website, but lets you download movies too. Facebook’s Windows 10 app is also close to feature-parity with the web version. Since the launch of Windows 10 S, Microsoft has brought the full-fledged Office Suite to the Store, filling a huge gap for students. It’s also been pushing companies to convert existing Win32 apps like Spotify and iTunes for the Windows Store. As more Windows 10 S devices are released, I think we’ll see more of the traditional apps we know and love pop up in the store. Windows 10 S was billed as direct competition against Chrome OS, and Chrome OS only succeeded because we now live an era where you can do most things from a browser. My time with Windows 10 S has been usable for much the same reason. You can do pretty much anything from a browser nowadays. The bulk of my work happens in the browser, and if there’s something I can’t find on the Windows Store – like SimpleNote or Google Play Music – the web version is generally just as useful. Sometimes a product’s desktop websites is preferable to the app version anyway (i.e. Facebook) and for apps available in neither the store nor online, there are usually excellent alternatives somewhere on the Web (like Pixlr for Photoshop). All that being said, I still think Microsoft is being overbearing with Windows 10 S. I’m not bothered by the Windows Store limitation very much, but not being able to set another browser by default is ridiculous. If Chrome or a newcomer ever arrives in the Windows Store, I should be free to set those as my default. Being limited to Bing as your default search engine within Edge is arguably even worse. It does nothing to improve my user experience. All Microsoft is doing is forcing me to type in Google.com whenever I want to search something. It’s dumb. I test a lot of laptops. By the time I’ve finished installing all the software I want, I almost always note at least a subtle hit in battery life and performance. This has not been the case with the Surface Laptop. There isn’t much that’s particularly remarkable about the Surface Laptop’s hardware. The 47 watt-hour battery is positively average for its size and spec-class, yet after loading it with a myriad of apps, the laptop has not slowed down down a bit. More importantly, battery life isn’t jumping around as dramatically as I’m used to. Even with the Surface Book and new Surface Pro, which generally deliver excellent battery life, I sometimes see precipitous drops into the three to four hour range under heavy loads. Try as I might, I have not been able to get a similar drop in battery life from the Surface Laptop. Not only does it sometimes have great battery life – it always does. Of course, that’s because UWP apps are generally more efficient. 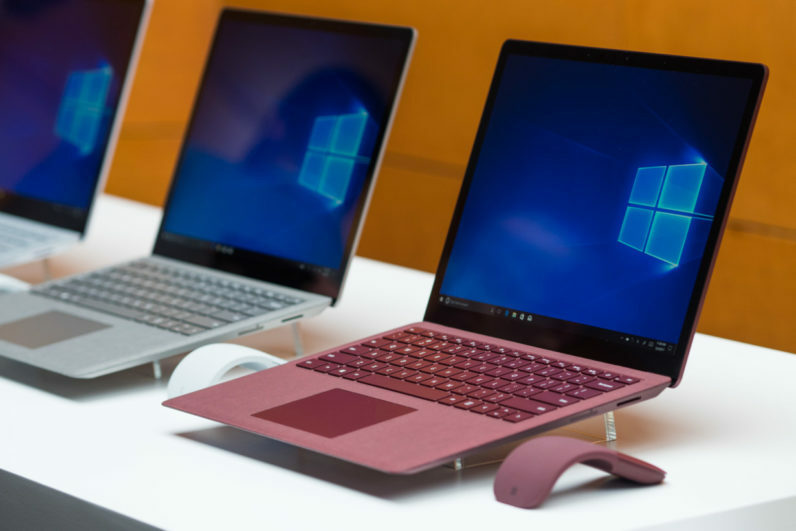 With careful attention, you can get the same consistency from Windows 10 Pro. But that’s not something the average user will care to do , which brings me to my next point. Tech-saavy PC users know they can keep a system running smooth for many years with some elbow grease. They pay careful attention to every app they install, checking to make sure it’s not installing any strange add-ons or drivers. They uninstall apps when they’re done to keep systems operating smoothly, and make sure their startup processes are limited to the bare essentials. They’ll make sure the registry is nice and tidy, and perhaps do a fresh install every now and then. But these aren’t things most people should have to worry about. There’s a peace of mind that comes with the more modern approach to apps in Windows 10 S. I can install apps willy-nilly, without stressing much over their impact on performance, security, or battery life. And it’s nice to try new apps and be pleasantly surprised, for a change. I’ll reiterate that if you treat Windows 10 Pro like Windows 10 S and only install apps from the Store, you’ll probably get much of the same performance and battery life benefits (I’ll be putting that to the test soon). But the question of whether people would actually adhere to that strategy is another matter altogether. I still think the ideal approach would be akin to Android, where it’s relatively difficult for users to install apps from outside the official marketplace, but not impossible. That way only the most tech-saavy people would be tempted to install external apps; people who were aware of the associated performance risks. As it stands, Windows 10 S is still not ready for the mainstream. Like Chrome OS, I think it’s perfectly serviceable for secondary computers or on a very tight budget, but probably isn’t your best option if you don’t have access to another computer with a full version of Windows on it. But that caveat is only applicable because the Store is still too barren. If all the apps you need are on the marketplace, then Windows 10 S genuinely provides a more cohesive, intuitive, and reliable PC experience. Microsoft is walking a thin line between limiting its users and improving its OS, but Windows 10 S is a step in the right direction.